For this last issue of 2012 we have three lovely covers for you to enjoy. The water-themed front cover comes from Lin Liu at Anyang Normal University, who together with a team from China has developed a colorimetric assay for the determination of arsenic. This was applied to the testing of drinking water and could detect levels set by the World Health Organization. Our inside front cover comes from Okayama University, Japan, where a team led by Michihiro Miyake has been looking at layered double hydroxides, often used as inorganic hosts for developing functional materials. The striking image on the back cover showcases research into surface plasmon-coupled emission-based sensors by Professor Yao-Qun Li’s research group from the Department of Chemistry and Key Laboratory of Analytical Sciences, Xiamen University, Xiamen, China. These three cover papers will be free to read for 6 weeks. This issue also features a HOT article by Haifei Zhang and colleagues at the Univeristy of Liverpool. Capillary columns were prepared and evaluated on their use in HPLC. This paper will be free for 2 weeks. The latest issue of Analytical Methods has just hit the web, and we have 4 fantastic covers, all from HOT articles, for you to take a look at. On the outside front cover we have an image from Marcos Eberlin, Jesui Visentainer and colleagues from Brazil who have been working on profiling fats and meats using easy ambient sonic-spray ionization mass spectrometry in an effort to monitor quality control. From Sabato D’Auria and colleagues in Italy comes a piece of artwork from their research into an assay that can detect benzyl methyl ketone, which is often used as a precursor in making amphetamine. On the inside back cover, we showcase research into high-throughput sialic acid assays by Shashi Prajapati and colleagues from the Cell Culture Development – High-Throughput Analytical Group, Biogen Idec Inc, Cambridge, MA, USA. We showcase research on the outside back cover into HPLC stationary phases by Xinmiao Liang and colleagues from the Dalian Institute of Chemical Physics, Chinese Academy of Sciences, Dalian, China. The latest issue of Analytical Methods is now available, and we have three covers this month. 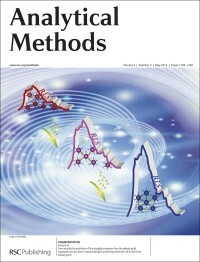 On the front cover, Giulia Mollica, Laurence Charles and colleagues from CNRS, Marseille, France, use solid-state NMR to obtain essential information to understand the molecular origin of changes observed in MALDI mass spectra as a function of experimental conditions used for sample preparation. 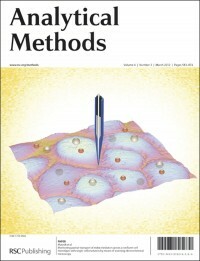 On the inside front cover, Luis Alamo-Nole and co-workers at the University of Puerto Rico, Mayaguez, USA, present a size-exclusion method that was developed for the separation of thiol-capped Cd(Se,S) quantum dots (QDs) synthesized in the aqueous phase, which is fast and reproducible. 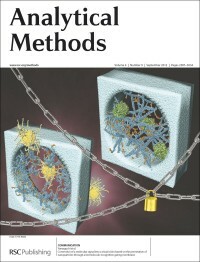 On the back cover, Zhang-Jun Hu and co-authors from Tongji University, Shanghai, China, have fabricated magnetic microspheres which capture lead ions rapidly and selectively from aqueous solution so that facile onsite preconcentration and monitoring of lead ions at trace level is possible. All these cover articles will be free to access for 6 weeks – don’t forget to also take a look at the HOT articles featured in Issue 10. Take a look at the latest issue of Analytical Methods, now available online. 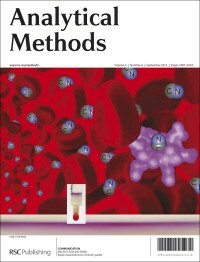 On the front cover is an article that has already been highlighted in Chemistry World. Christine Männel-Croisé and Felix Zelder of the University of Zürich have developed a method that enables them to quickly detect blood cyanide levels through a simple colour change. The technique only takes two minutes and does not require any laboratory equipment. The inside front cover also features work on a method involving a visible colour changes. Takeo Yamaguchi of Tokyo Institute of Technology and co-workers show conversion of a biomolecule signal into a visual color by nanoparticle permeation through a biomolecule-recognition gating membrane. Both these covers are free to access for 6 weeks, so do let your colleagues know. 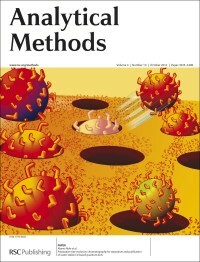 The latest issue of Analytical Methods has now gone online. This month we have two covers for you to enjoy. On the outside front cover is a striking image from Nicholas J. FitzGerald and colleagues from the Defence Science and Technology Organisation, Australia. They have developed a miniature, real-time optical sensor that can detect the absorption levels of the chemical warfare agent methyl salicylate in a soldier’s clothing. On the inside front cover is a colourful image from a team from Canada and Italy. Maria Minunni and Kagan Kerman, from the Università degli Studi di Firenze and the University of Toronto Scarborough, respectively, have with their team been studying Alzheimer’s disease and looking at label free probing methods used in its research. These articles will be free to read for 6 weeks, so take a look today! 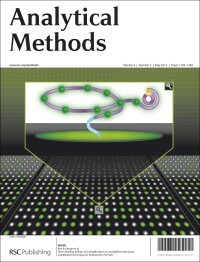 Analytical Methods Issue 7 is now online! We have some very colourful images this July on the covers of Analytical Methods. The front cover image comes from Japan, where Takashi Jin from Riken, and colleagues have been developing quantum dots to be used as fluorescent probes for measuring the cytoplasmic viscosity of a single living cell. Still in Asia for our inside front cover, the image comes from Xiaocheng Weng and Xiang Zhou from Wuhan University, who together with colleagues have been developing a sensor to detect silver and cysteine with the use of graphene oxide and G-quadruplex DNA. We also have a back cover this month! It features the work of Sabato D’Auria and colleagues at the Institute of Protein Biochemistry of the Italian National Research Council, and Selex-SI, Italy. Ephedrine is a precursor for the illegal preparation of amphetamines, therefore a quick and reliable detection system for its presence is essential. This month’s issue of Analytical Methods features articles on the theme of Pharmaceutical Analysis. Why not have a read of the editorial for this issue written by our guest editor Melissa Hanna-Brown, from Pfizer Global R&D Labs, UK. The cover image for this month comes from Raluca-Ioana Stefan-van Staden and Rahel Girmai Bokretsion from the National Institute of Research for Electrochemistry and Condensed Matter, Bucharest, Romania. Together they were looking at the enantioanalysis of ketoprofen by using three enantioselective, potentiometric membrane electrodes based on C60 fullerene and its derivatives. This paper will be free to read for 6 weeks. Also in this month’s issue is the latest Technical Brief from the Analytical Methods Committee, which is free to access for all. Take a look at the latest issue of Analytical Methods, complete with two striking covers (if we do say so ourselves). 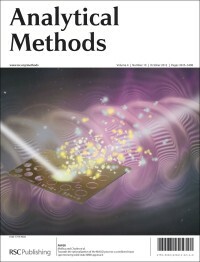 The front cover highlights work from Ute Resch-Genger of BAM Federal Institute for Materials Research and Testing, Berlin and his collaborators from across Germany. They have established an improved signal amplification protocol for biological assays using rolling circle amplification RCA, direct enzymatic labeling and the potential Cy3-substitute DY-555. The authors say their straightforward detection protocol can be applied to many other assay formats using a DNA primer to improve their detection limits, such as immunoassays, and that the strategy could be attractive for point-of-care diagnostics. Featured on the inside front cover is a communication from Erqun Song, Yang Song and their colleagues from Southwest University, Chongqing, China. They report the one-step synthesis of N-acetylglucosamine-functionalized gold nanoparticle (NAG–AuNP), which then served as a facile, economic, highly sensitive and selective sensor for the detection of lectin from wheat germ, based on colorimetric and resonance light scattering signals. The authors expect that their new nanoparticles could be adapted for many applications in the future. These cover articles will be free to access for 6 weeks, and don’t forget to take a look at the HOT papers in this issue too. Analytical Methods Issue 4 online! Issue 4 of Analytical Methods in now available online. On the front cover is an interesting picture from Rudolf Schneider of the BAM Federal Institute for Materials Research and Testing, Germany. Together with colleagues, their paper is on the study of the influence of temperature deviations on assay parameters. They tested parameters such as signal variation coefficients, limit of detection and measurement ranges by testing for two anthropogenic markers, caffeine and carbamazepine, at a variety of temperatures. On the inside front cover is some artwork from Jyongsik Jang and colleagues from Seoul National University, Korea. They have fabricated a new type of fluorescent boronic acid-modified polyacrylonitrile (B-PAN) nanoparticle that can be used for an enantioselective monosaccharide sensor. Using a fluorescent polymer nanomaterial for sensors offers advantages, such as low toxicity, environmental safety, diverse functionality, and easy surface modification. Issue 3 of Analytical Methods is now available for you to browse. We take you to Germany and Brazil on this month’s covers: transport across cell monolayers studied by SECM, and the determination of mercury in soil by CVG-ICP-MS.